Artist Kathryne Husk creates photographs and paintings that represent the experiences of marginalized people. Husk's composition 'Weak and Weary' addresses society's perception that disabled people are lesser than others. The composition is symbolically charged, with shadows of ravens hovering over a hunched, black-clad figure pointing to a feather. 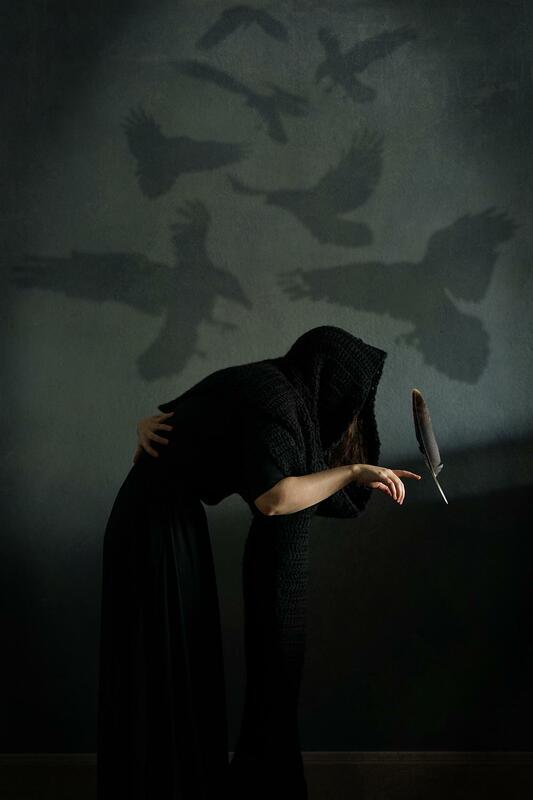 The ravens represent the figure’s able-bodied former self; the feather is held up to society as evidence that an able body once existed. “It’s about feeling like society sees you as old before your time, because your body is unable to do things that you wish it to do,” Husk writes in the accompanying artist’s statement. Husk, who lives in Olathe, draws imagery from mythology and fairy tales to give able-bodied people a feel for the experience of people with disabilities. “One of the reasons I pull from (mythology and fairy tales) is that it creates this timeless feel. The disability narrative is timeless,” Husk says. The Americans with Disabilities Act was not signed into law until 1990, Husk notes. Until then, the disabled community was draped in something like an invisibility cloak. Husk has multiple disabilities stemming from Ehlers-Danlos Syndrome, a connective tissue disorder that affects mobility and the health of internal organs. Husk experiences an additional sense of being marginalized because they identify as non-binary transgender. Husk does not dentify as a woman or a man and uses gender-neutral pronouns. Husk's composition 'Wrapped' shows a cornered person caught in societal opinions of so-called correct presentation of self. Regardless of where Husk goes, either their gender identity or their disability and use of mobility aids is a sticking point. Many times, queer meeting spaces are physically inaccessible — smaller businesses such as independent coffee shops, for instance. “If it’s a Christian space, then my body will only be acceptable to a point, depending upon how accessible the space is. But my gender, who I am, will not be accepted. So, you experience different levels of marginalization depending upon the environment, depending upon what you’re interacting with,” they explain. Husk’s piece “Wrapped” depicts this intersection of queerness and disability. In the composition, yellow yarn signifies society’s insistence that a queer person or a disabled person present in a “socially acceptable” way. In color symbolism, yellow is for wisdom and the intellect, Husk says; they use it here to convey that society thinks it knows what’s best for individuals. The individual at the center of the work is backed into a corner, and though they want to break free of the yarn, they must exercise extreme caution in disentangling it; one wrong move can result in further social isolation or a violent death through a hate crime, Husk writes in the piece’s description. That symoblism is one of the features that attracted Jeff Langlois, Red Light Gallery’s curator and manager, to Husk’s work. Red Light Gallery’s grand opening was October 5. Langlois chose Husk, who is originally from Hawaii and whose work has shown in galleries all across the nation, as the first to be shown in the space. Langlois says he was also interested in Husk’s work because of their committment to disabled-rights advocacy work. All of Husk’s work is similarly concept-driven, “conveying emotions through imagery,” as Langlois puts it. Husk's 'Asylum' addresses social stigmas associated with mental illness. Husk points out that many accessibility issues could be remedied by committees and boards of businesses and nonprofits requesting that a person with disablilities be asked to voice their opinion at the outset of planning for an event or new facility. Husk has volunteered to assist in such meetings in Kansas City, but says no one has ever taken them up on it — even though paying attention to these things benefits the world at large. “Memento Morbus” by Kathryne Husk, 5:30-8:30 p.m. on First Fridays; 5-7 p.m. Wednesdays; noon-7 p.m. Saturdays and by appointment through Friday, January 25 at Red Light Gallery, 715 Commercial Street, Atchison, Kansas 66002. Lt. Gov. Jeff Colyer was on hand Thursday for the unveiling of a book to educate children about interacting with people who have disabilities. “Darby Boingg Has an Adventure and Meets a Person with Disabilities” features Boingg, a wallaby with human characteristics, who meets Ian, a young man in a motorized wheelchair. Sunflower State Health Plan hosted the book signing at the Topeka and Shawnee County Public Library. The event featured author Michelle Bain and Ian Kuenzi, a Topekan with cerebral palsy who was her inspiration. You wouldn’t think mountain climbing would be an activity a paraplegic person could still enjoy. But one group’s efforts to adapt activities like mountain climbing are coming to fruition. In the first part of Friday's Up to Date, we talk about how they’re making sports more available to people with disabilities and what inspired them to get involved with this project. On Election Day, respondents to a new Tell KC query told us their polling places were not well-equipped to help them vote. Mary-Corinne Corely has cerebral-palsy-like symptoms in her legs due to an illness when she was an infant. Some days, she says, the symptoms make it impossible for her to do steps at all.